I am a mom to 5 children, aged 5-19 and have used cloth diapers with all of them. I also breastfed them all, and as a result, needed good nursing pads. With my last 2 babies, I found I had several cloth diapers that had seen much better days but I didn't want to use them for rags yet, plus I needed breast-pads. 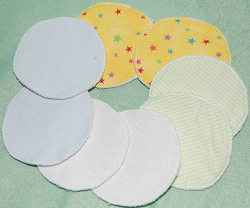 I cut out several nursing pads using a large glass to trace them in the middle of the prefold part of the diaper. They ended up being about 5" circles. I didn't need to put several layers together since they were thick enough. I simply zig-zagged around the edges, and voila! Great free nursing pads! I still have them, and my little girls can use them for dolly pillows.